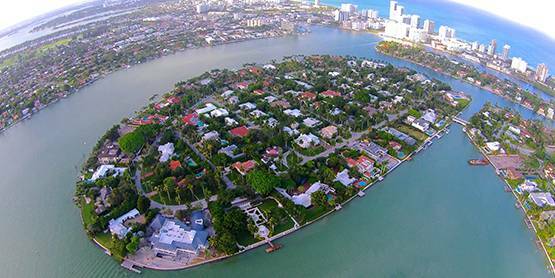 La Gorce Island is a guarded Miami Beach Island located in the North end of North Bay Road and Pinetree Drive Circle. 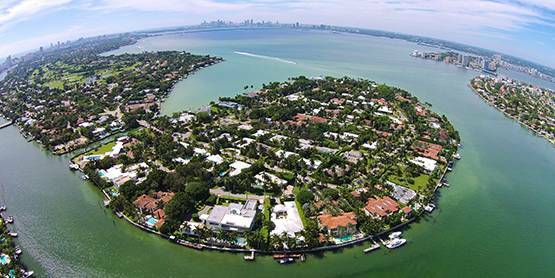 There are a total of 98 Single family homes on the Island, 33 are waterfront homes, and 53 are non-waterfront homes. La Gorce Island was named after John Oliver La Gorce, President of the National Geographic Magazine Company. He was a friend of Carl Fishers who created the resort city known as Miami Beach. Carl Fisher promoted Miami Beach in the 20’s as America’s Greatest Year-Round Outdoor Playground. John Oliver La Gorce was a supporter of Miami Beach and sponsored the La Gorce Open, attracting golfing stars of the era, who could golf in one of the 4 Miami Beach golf courses. Carl Fisher in return for his friends un-wavering support named La Gorce Island which he created in 1924 as an honor and tribute to his friend. Although the Island was built in 1924, It was not developed until in 1936 when it was bought by Frederick Maytag and his partner Mr. Quackenbush who immediately proceeded to develop it. The C.D. Wagstaff Co of Evanston, Illinois were hired to do the landscaping, they planted 386 Royal Palms and over 775 Silver and Date Palms. 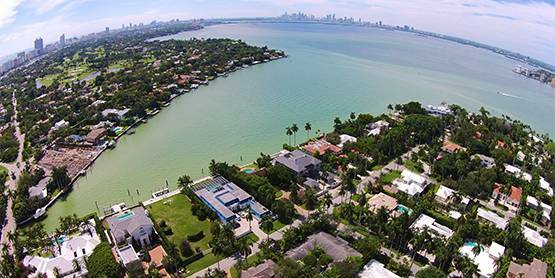 The master landscaping plan is still respected today, the palms are always perfectly manicured standing in elegant unison, commanding respect and glamour to the ever classy La Gorce Island. 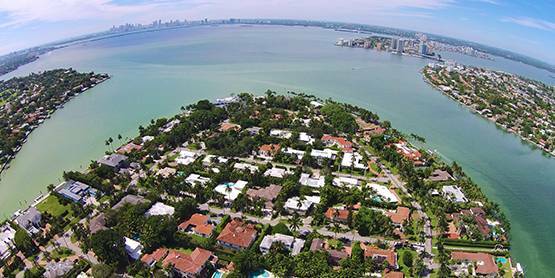 Today La Gorce Island’s Homeowners Association remains very involved managing the responsibility passed onto them back in 1946, they maintain the La Gorce Island parkways which lays within each property. The parkways are not allowed to be planted by the Island residents in order to adhere to the original landscaping plan contributing to La Gorce Island’s picture perfect setting. The Homeowners Association, levy a yearly assessment on each lot, creating funds to re enforce the Island’s security, adding to the 24 hour guarded gate entry, roving street patrol all day and night plus water boat patrol throughout the night. The Island has a waterfront park and breezeway for the residents enjoyment. 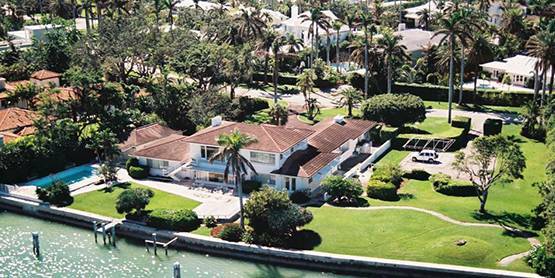 Homes in La Gorce Island date from 1936 to the present. 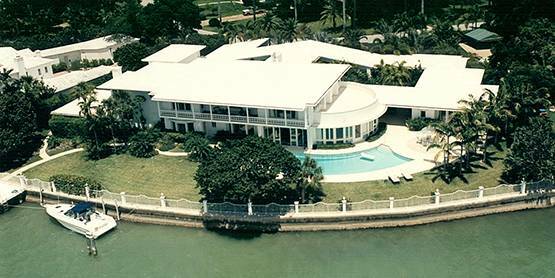 Respected architects such as Russell Pancoast in the 50’s designed his last house for Mr. & Mrs. McKnight of the 3M Companies, a Mid Century Modern beauty very unlike the Mediterranean architectural revival homes he was known to build. However, in keeping with his wife (a non practicing architect also) love and design of tiles, the use of tiles including a fabulous mural of the Caribbean were found throughout the outdoor loggias and cabana bar areas. 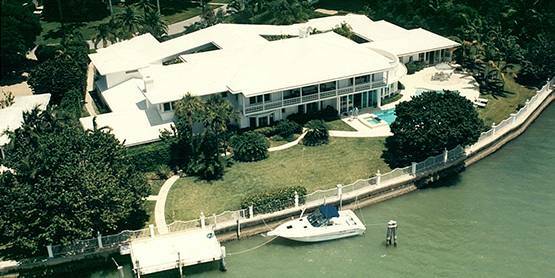 I had the pleasure of selling this house for Mrs. Mc Knight in 1993 for what was then a whopping $2,150,000.00. In 2006 the house sold for $17M and it was demolished. Palm Beach society architect Maurice Fatio is another architect whose imprint and classic style still reigns on La Gorce Island. His Mediterranean-style mansions signature Italianate homes with distinctive Neoclassical and Greek Revival elements provided the perfect scale and style to stand the test of time. 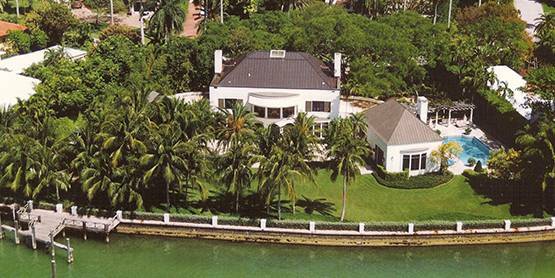 Long ago I named this house La Gorce Princess, I sold it first in 1994, for $3,325,000.00. 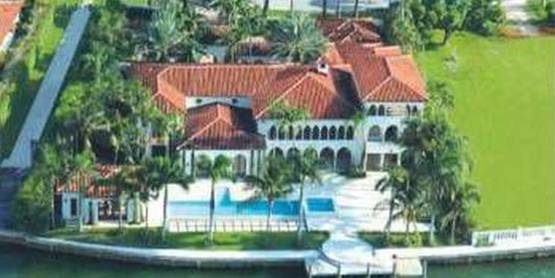 I sold it again in 1999 for $5.2M and again in 2004 for $10.7M. Luckily every owner of this home along the way, has lovingly improved upon it and respectfully cared for the precious glamorous La Gorce Princess that she is. I also had the pleasure of selling in 2015 one of the new built homes developed by Brett Palos, Bart Reines, Argent Design and Kobi Karp architect, this is a group that will go down in Miami Beach history as the creator of some of its most beautiful homes. Amazing scale workmanship, and classic being written and will be part of the the future history of classic transitional style homes with a traditional front matching the Islands style and a modern interior this home fit perfectly within the La Gorce Island aesthetic. It sold for a record breaking price of $19.7M. And now there is a pending sale on the Island that is expected to break all records built by respected builder Thomas Danluck and his wife Debbie who clearly understand and love La Gorce Island which was a place they called home for many years. This elegant modern style house was asking a whopping $38M, surely its sales price once closed will set a record high for a single family residence on Miami Beach. 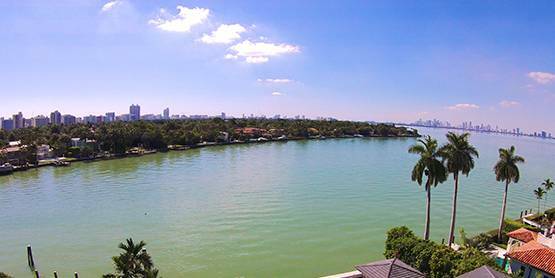 La Gorce Island’s understated elegance continues to attract the wealthy Miami Beach buyer looking for classic peace and tranquility in the grand comfort the homes on this Island offers. Many home owners own multiple lots and have created Estates rivaling those found in higher profiled locations. It is La Gorce Island’s low key quiet wealth and elegance that reigns and prevails in this very exclusive enclave, where classic to modern architecture blend together seamlessly, creating a harmonious balance of lifestyles enjoyed by the La Gorce Island residents who call this Miami Beach Island hideaway home. If you are interested in buying, selling or renting in La Gorce Island, contact me at 305-674-4022 or Esther@EstherPercal.com.